Nail Patella Syndrome (NPS) also known as NPS, Fong disease, hereditary onycho ­osteodystrophy (HOOD), Osterreicher-Turner syndrome and Turner-Kieser Syndrome. Nail Patella Syndrome is a genetic condition which affects the nails, knees, elbows and can cause iliac horns. There are, however, many other features that may be seen in this condition and other body systems such as the kidneys and eyes may be affected. In the skeletal system, tendons, ligaments and muscles can be affected as well as bones. The severity of the features of NPS and how often each feature occurs, varies between one person with NPS and another, even within the same family. Patients may be severely affected by one aspect of NPS but have much milder or no problems elsewhere. A patient with NPS does not have to have all of the features of the condition. It is very common for families to remain undiagnosed for several generations despite having been seen by doctors from a variety of disciplines. It is thought that NPS occurs in 1 in 50,000 people. 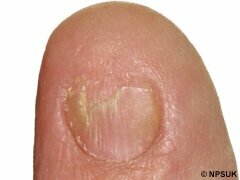 Nail changes are seen in 98% of patients with NPS but they may be subtle. 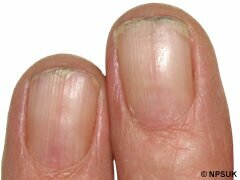 Nails may be missing, small or abnormal, ridged, pitted, discoloured, separated into two halves by a ridge of skin, thin or less often, thickened. 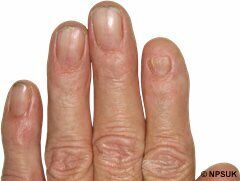 Nail changes may be noticeable at birth and are most often on both hands and are usually symmetrical. 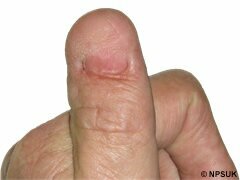 The thumbnails are the most severely affected nail, and the severity tends to decrease towards the little finger. Each individual thumbnail is usually more severely affected on the side next to the index finger. The only nail changes present may be triangular lunules, a characteristic feature of NPS, which means that the half moons seen at the base of the nail are pointed rather than rounded. The toenails are usually less severely and less frequently involved than the fingernails, but if the toenails are involved, it is often the little toenail which is affected.On the fingers there is often loss of the creases in the skin overlying the end joints of the fingers. This sign follows the same pattern of involvement as is seen in the nails so that the most frequently affected fingers are the index fingers, with the others less so towards the little finger. In addition to loss of skin creases there is often decreased ability to bend the end joints of the fingers. Fingers may also be more hyperextensible (bendy) and some NPS patient’s fingers may be held in a “swan­necking” position. In-curving of the fifth finger is seen in 35%. The patellae (knee caps) may be small, irregularly shaped or absent and one knee may be differently affected than the other. Frequent subluxation (slipping) or dislocation of the patella is common in NPS and may be associated with poor development of the muscles around the knee.The patella usually dislocates upwards and outwards. There may be prominent tibial tuberosities – a bony bump at the top of the shin. Tight hamstring muscles may stop some people with NPS from being able to fully straighten their knees. There may also be other problems with the knees and early wear and tear arthritis is not uncommon. 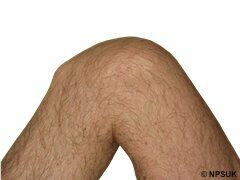 Symptoms associated with knee abnormalities in NPS included pain, giving way, a feeling of instability, locking, clicking, patella dislocation and the inability to straighten the knee joint. Other occasional knee problems may include, quadriceps muscle wasting, genu recurvatum (knees bent backwards), genu vagum (knock knees), genu varum (bow legs), different leg lengths, rotational deformities of the legs (twisted legs), Osgood Schlatter's disease, osteochondritis dissecans, and absence or abnormality of the anterior cruciate ligaments. In some patients who have had knee operations for NPS the anatomy of the joint has been found to be abnormal, including abnormal muscle attachments. 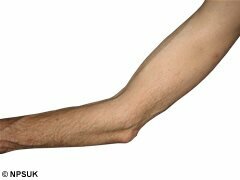 There may be difficulty straightening the elbow, and one elbow may be more severely affected than the other elbow. Elbow contractures tend to stay the same over time. There may also be difficulties turning the hand over so the palm face upwards. Typical findings on an X-ray include abnormalities of the head of the radius (one of the forearm bones), and abnormalities of the end of the humerus bone (upper arm). There may be dislocation of the head of the radius. Webbing (pterygia) may occur across the elbow joint. When webbing is present, surgery may be very difficult as important nerves and blood vessels often run in the web of skin. Iliac horns are cone-shaped, bony bumps that arise from the back of the iliac bones on both sides the pelvis and are only seen in NPS, but only in two thirds of NPS patients. Occasionally it may be possible to feel large iliac horns through the buttocks, but in most people they are only detectable on an X-ray and do not usually cause any problems. Involvement of the ankles and feet Talipes (club foot) occurs in about 20% of patients and may affect both feet. Tight Achilles tendons are a common finding and can cause toe-walking. Achilles tendon lengthening operations are sometimes necessary. 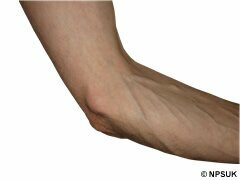 Flat feet is also common in NPS. Spinal and chest wall problems Back pain occurs in half of NPS patients and can occasionally start during childhood. A sway back (increased lumbar lordosis) is also a common finding. Spinal problems may occur including scoliosis, spondylolisthesis, spondylolysis, and arthritic changes. Pectus excavatum (a dip in the breast bone) may also occur. Occasionally, NPS patients may have clicking in their hips or have had congenital dislocated hips. Shoulder abnormalities may occur occasionally. Generalised joint hyperextensibility (bendiness) can also occur, most commonly in children, and particularly in the fingers. Some patients describe generalised muscular pains, usually worse in cold, damp weather. Specific diagnoses that have been made included fibromyalgia, polymyalgia rheumatica and fibrositis. It seems that many people with NPS have a lean body build and some patients may have difficulty putting on weight (particularly muscle) despite adequate dietary intake and exercise. There is a particular decrease in muscle mass in the upper arms and upper legs. Some female patients have poor breast development. The tendency to be very lean is most evident in adolescents and young adults and becomes less apparent after middle age. Many people with NPS have a “sway back” (increased lumbar lordosis) and this may make the buttocks appear prominent. There tends to be a high forehead and hairline, particularly at the temples, resembling a male pattern hairline when seen in women. The head may appear slightly larger compared with the body, particularly in children. This may be because the height of NPS patients tends to be slightly below average whereas the size of the head is the same as in the general population. Kidney involvement occurs in 30% to 50% of patients, but kidney failure only occurs in 3% to 5%. The first sign of kidney involvement is usually proteinuria (protein in the urine). Proteinuria may start at any age from birth onwards and may come and go. Kidney problems may occur for the first time during pregnancy or be made worse by pregnancy. Proteinuria may not cause any problems or may progress to nephrotic syndrome (swelling, and low protein in the blood) or nephritis, and occasionally to kidney failure. Kidney failure may appear to happen rapidly, or after many years of asymptomatic proteinuria. Kidney failure needs to be treated with dialysis or kidney transplantation. When kidney transplantation takes place in NPS, it is usually successful. The main kidney abnormality in NPS is a problem with kidney function and the occasional abnormalities of kidney structure (visible on an ultrasound scan) that may occur in NPS are probably coincidental. In pregnancy, there is an increased frequency of preeclampsia (high blood pressure, swelling and proteinuria). Glaucoma has recently been recognised as a feature of NPS (raised pressure in the eye, cupping of the optic disc and visual field defects). Primary open-angle glaucoma is the most frequent abnormality, although ocular hypertension (raised pressure in the eye) may also be seen. Glaucoma or ocular hypertension occurs in 17% of NPS patients over all but in nearly 30% of those over 40 years of age. Glaucoma or ocular hypertension can occur at a younger age in NPS patients than it does in the general population. This aspect of NPS is treatable and therefore screening for glaucoma in NPS patients is strongly advised. Some NPS patients have Lester’s sign which is a pattern of darker pigmentation on the portion of the iris (the coloured part of the eye) around the pupil which is the shape of a flower or cloverleaf. This is most visible in blue eyes. It is more common in NPS but it can also be seen in the general population. Some NPS patients have problems with their teeth, such as weak, crumbling teeth and early loss of teeth. Some patients had been told they had very thin tooth enamel. A third of NPS patients have problems with their bowels. These included irritable bowel syndrome (characterised by alternating constipation and diarrhoea with cramping abdominal pain) or significant constipation which was usually present from birth. Some NPS patients have neurological symptoms including occasional episodes of numbness and tingling and sometimes burning sensations in the hands and sometimes the feet, with no obvious cause. These symptoms could last from minutes to hours. There are a number of reasons why patients with NPS could have neurological symptoms, including from spinal or joint problems or after joint surgery. However, these symptoms may occur in patients without significant spinal or joint problems. Some patients describe having symptoms related to a poor circulation, such as having very cold hands and feet, even in warm weather, or Raynaud ’s phenomenon (cold hands associated with a change in the colour of the hands). Although often quoted as being a feature of NPS, cleft lip and palate has been reported in only one NPS patient in the medical literature and it is much more likely that this was purely coincidental. Similarly, the occurrence of NPS in association with deafness, cancer predisposition, mental retardation and psychosis are more likely to be coincidental. NPS is caused by a change in a gene called LMX1B, which is located on chromosome number 9. This gene is important in the development of the limbs, nails, kidneys and eyes, and when a person has an altered copy of the LMX1B gene (also called a gene mutation), this causes the problems seen in NPS. NPS affects both males and females equally and can occur in any race. All genes come in pairs as a person receives one copy of each gene from their father and one from their mother. A person with NPS will have one altered copy of LMX1B and one normal copy. Each time a person has a child they pass on just one from each pair of genes therefore a person with NPS has a 50:50 chance of passing on NPS to each child they have. This type of inheritance is called autosomal dominant inheritance. What cannot be predicted is in what way, and how severely, each child inheriting the altered gene will be affected, as this varies from person to person, even within the same family. Most people with NPS have inherited the gene alteration from an affected parent but in some patients the gene change has occurred for the first time in them, and there is no previous family history of NPS. NPS does not skip generations – an unaffected person from an NPS family cannot pass it on. However, the features of NPS can be quite subtle. If there is a doubt as to whether a relative is affected by NPS it is important that they are examined by a doctor who knows about NPS, such as a Clinical Geneticist, in order to confirm or rule out whether a person is affected. If there is any doubt about the diagnosis of NPS in a person it is possible to have a gene test via your local Regional Clinical Genetics Service (your GP can make a referral). A gene change can be found in over 85% of families with NPS. During a pregnancy, it may be possible to tell whether a baby has inherited the NPS gene alteration by testing the pregnancy (prenatal diagnosis). However, it is not possible to predict how severely the baby would be affected. Prenatal testing via chorionic villus sampling (CVS) can be done at approximately 10 ½ weeks of pregnancy. Ultrasound scans during a pregnancy may detect major problems with the limbs eg club foot, but most of the features of NPS would not be possible to detect on an antenatal ultrasound scan. Screening for kidney problems once a year from birth. This is done by assessing urine protein:creatinine ratio (available from your GP) or urine dip ­sticks. If any abnormalities are detected a referral should then be made to a renal physician (kidney specialist). Screening for glaucoma every two years in adults. This should include measurement of intraocular pressure (pressure in the eye), examination of the optic discs and assessment of visual fields. If any abnormalities are detected, a referral should then be made to an ophthalmologist (eye specialist). Genetic counselling should be offered to all individuals with NPS to answer any questions the patient may have, discuss the different aspects of the condition and discuss inheritance pattern and possible implications for future children. Before treatment such as surgery is considered for orthopaedic abnormalities, it is recommended that a magnetic resonance imaging scan (MRI) is done to detect possible abnormal anatomy. Or from your local Regional Genetics Service via referral from your GP. This information sheet has been prepared for NPS(UK) by Dr. Elizabeth Sweeney MB ChB, MRCP, DRCOG, Consultant Clinical Geneticist at the Royal Liverpool Children’s Hospital.